OK. The Tesla P100D is still the quickest production electric car on the planet. But Audi says its E-Tron will be faster. What’s the difference? A car that accelerates rapidly is quick. A car with a high top speed is fast. Some people prefer one and some the other. That the P100D is quick is well known. A bevy of YouTube videos show it dusting off some of the world’s most expensive and exotic cars at the drag strip. What those videos don’t show is how much time the Tesla needs to cool down before its next run. 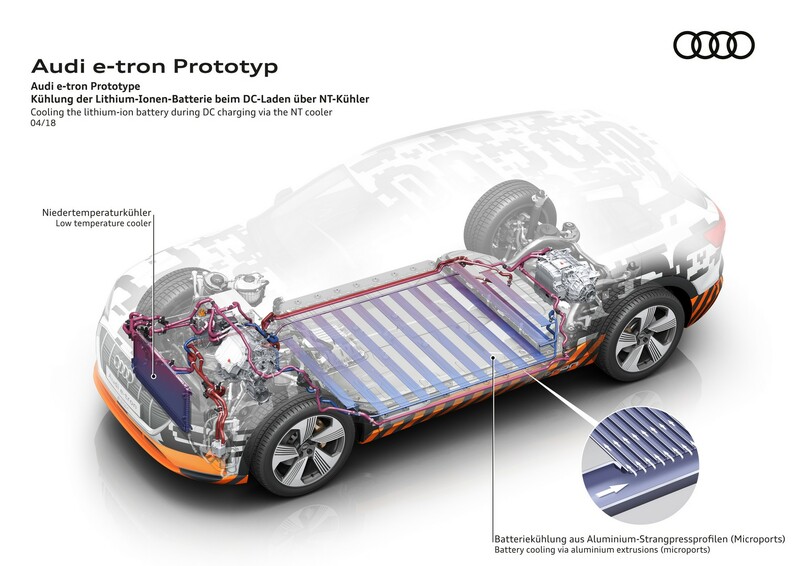 Anno Mertens, head of charging infrastructure and electric mobility for Audi, told the press last week that the upcoming Audi E-Tron will use an advanced thermal cooling system that incorporates a heat pump. The system is designed to keep the 95 kWh battery pack between 25º and 35º Celsius at all times — especially during high performance driving periods, according to a report in Norway’s TU News. “The thermal cooling system will make it possible to push the pedal on the Audi E-Tron over and over again without any impairment of performance,” he said. “We can cool the battery in any situation so the car does not get performance impairment — neither at high load over time,” says Benedict Still, a spokesperson for Audi. Audi is part of Volkswagen Group. So is Porsche. What Audi knows, Porsche knows, and vice versa. Porsche has said similar things about its upcoming Mission E and Cross Turismo, both of which it says will be able to accelerate repeatedly and maintain high cruising speeds better than Tesla cars are capable of. But make no mistake — the Tesla P100D is still far quicker to 60 mph than the AudiE-Tron will be. If it is quickness once in a while you crave, the Tesla is the car for you. If quickness again and again, coupled with a high top speed, is your goal, the Audi may be your best choice. Audi says its battery is made up of 12 pouch cells from LG Chem packed into 36 shoe sized modules. Each pouch has a capacity of 60 amp-hours. Prismatic cells from Samsung can also be used in the battery pack. They are encased in aluminum while the pouch cells come in laminated plastic bags. The cooling system is located under the cells and is incorporated into a ladder type frame. The segments of the ladders, made of aluminum, are filled with glycol and connected to the cells using a specially developed adhesive. “The adhesive is very good on thermal transfer,” says Still. A conventional radiator in front of the vehicle cools the fluid. Surplus heat from the cooling system helps warm the interior of the car and the heat pump aids in getting the battery pack up to temperature in cold conditions. The total weight of the battery pack is about 1500 pounds. Despite sending a shot across Tesla’s bow concerning cooling and the ability to use its performance time after time, Audi still respects Tesla for the innovations it has brought to the industry. “Ask me, I would say that it is good for the whole industry that there are good electric cars on the market. It’s good that charging is simple, not complicated. It helps the industry by people using and loving the cars and being good ambassadors for technology,” Mertens says. He had some other things to say about charging infrastructure. We’ll get to that subject soon in a companion story.